Feel healthy, well-thy and happier than ever before! 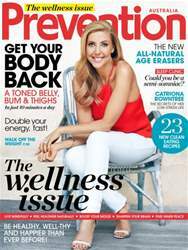 Everything you need is inside Prevention's very first Wellness Issue, on sale now. Slim down, tone up and double your energy levels (in just 10 minutes a day) with our expert-approved fitness plan, look younger naturally thanks to the new breed of anti-ageing power flowers, and sleep tight every night with our special health report. Plus, eat well and improve your wellbeing with 23 new clean eating recipes, from DIY muesli to filling salads and guilt-free desserts.